Put the finishing touch on all of your fun and festive baked treats with these Regal Foods chocolate sprinkles! Trust Regal Foods for a consistent product that's sure to please all of your patrons time and time again. Sprinkle these tiny, thin, rod-shaped confections into your signature cookie batter, atop a flavorful ice cream sundae, or use them to garnish frosted cupcakes. They'll add sugary sweetness and unique texture to any dish. An extremely versatile, must-have ingredient for your ice cream shop, bakery, or diner, this 5 lb. bag of sprinkles will keep you in good supply. These chocolate sprinkles are exactly what I wanted - standard chocolate jimmies. They arrived unbroken and in good condition inside a bag that was packaged inside a box. The amount you get mostly fills up a #10 size can. I really wanted to love these, and probably would have if it weren't for the fact that both times I was sent them, the bags they were in busted open. Luckily, Webstaurantstore has great customer service, and they issued me a refund. I would love to try to purchase these again, but I'll have to wait until I know they're double bagging them! If you need a bunch of chocolate sprinkles, this is the way to go! Good quality sprinkles in bulk, you can not go wrong! They taste good and look great. Regal foods Chocolate sprinkles are delicious on top of ice cream. We carry these sprinkles at our ice cream shop and the little kids are always asking for sprinkles. I love these chocolate jimmies! Taste great, great price, and ships quickly. I use them on all of our chocolate cakes and cupcakes. Highly recommended. We have tried other chocolate sprinkles but none actually taste like chocolate, I'll say they only taste like candy. But this one are totally different. very yummy! we use these in our ice cream shop as a topping. sometimes people want sprinkles and hate the rainbow sprinkle option, so this is a perfect item for them! Do not try baking with these. They are for icecream or decorating frosting after baking. Chocolate flavor tastes very artificial but kids don't seem to mind. THIS WAS QUITE A BIT OF SPRINKLES IF YOU LOVE CHOCOLATE SPRINKLES. I LOVED IT. IT IS QUITE TASTY AS WELL. ENOUGH TO GARNISH MAKE PLENTY OF CUPCAKES AND CAKES. I am really happy with these chocolate sprinkles. We love them on ice cream and they work really great on all of my cupcakes too. The chocolate sprinkles are wonderful and taste great. They are great for garnishing our chocolate sundaes and are very delicious. They are well packaged during shipping. This 5 lb bag of chocolate sprinkles will definitely meet all my chocolate sprinkle needs! They came quickly, secured in a bag, and have a good flavor. The chocolate sprinkles are great and taste really good. A great topping for our donuts and other baked goods. Great for our Italian chocolate cream bagel spread. We are very happy with the taste and quality of these sprinkles. We use them on marshmallows and Gourmet caramel apples and our customers love them. Love that this is a bulk item. We go through these sprinkles frequently in our ice cream shop. A great seller here and our customers enjoy them! I bought this 25 lb box of chocolate sprinkles this time because we went through the smaller box of chocolate sprinkles that we bought on this website. They are really good and they sell quickly! Chocolate sprinkles by regal foods actually taste like chocolate and i have so happy. Some company's say they are chocolate but they are just brown colored. These are great. The Regal foods chocolate sprinkles are very good and perfect for decorating cookies. They have a nice chocolate taste and the kids love working with them. 25 pounds of chocolate sprinkles can't be beat. These little shiny sprinkles of chocolatey goodness add the finishing touch to so many baked goods! Cookies, cakes, cupcakes and ice cream all need a little chocolate sprinkle. The Regal chocolate sprinkles taste very nice and are a great way to garnish cookies and pastries. The sprinkles are a great quality and very well priced. Think about it. 5 pounds of sprinkles is going to last a long time. Not only are these super cheap for how much you get, but they are really tasty too! I love the natural look and taste of chocolate sprinkles. We use a lot at our bakery and love the fact we can buy them by the 25 pound case. The sprinkles are our signature garnishment on our chocolate delight pudding. One of our most popular items in our Ice Cream Shoppe. Goes great on scooped ice cream, sundaes and on chocolate dipped waffle cones. Great price. many times we need a "smaller" size case and the 5 pound box comes in handy we dont always use a 25 pound box but we order 2-3 of these thanks for the pricing great value also ! Sprinkles... who does not love them. These are great quality sprinkles. They are the softer sprinkles. I go through a ton of these and Webstaurant has the best price by far. The Regal Foods chocolate sprinkles are great. They are nice sized and are wonderful for decorating sugar cookies and garnishing pies or cannolis. The sprinkles are a great price. Chocolate sprinkles !! We all love this item cuz is great for topping on cakes, cupcakes and ice cream. The taste great and are easy to handle. I just want to lay down and have someone sprinkle them into my mouth I am so so happy with this product and this purchase! Chocolate sprinkles are a must have at our ice cream stand. These arrived fresh and they separate easily when using. They don't clump together after using. Decent price point as compared to other retail facilities. These come repackaged in a shipping box in a clear plastic bag. Will purchase again as needed. Just received these and they are great. We started using them from the moment they came in. They look great on the mini and regular sized cupcakes. Kids and adults alike enjoy them very much. A very high quality brand of sprinkles that makes a great topping for ice cream or cupcakes. The sprinkles are packaged nicely and taste great. The chocolate sprinkles are very natural and great tasting. Perfect for ice cream, cupcakes, and chocolate cake! We use this to garnish our mocha frosting chocolate cupcakes and chocolated frosted chocolate cakes! Adds a nice texture crunch. These chocolate sprinkles go great on top of frozen yogurt. We order these to put out on our toppings bar at our frozen yogurt shop. Chocolate sprinkles is a favorite from our customers and love the larger quantity of the 25 pound bag. Just wished they came in better packaging. It surprises me how many people love chocolate sprinkles, but they make an amazing topping. The size and texture is just right, and the taste is amazing even if it does not go on anything. These are a must-have for any frozen treat shop. All customers, young and old, love to top off their frozen treat with sprinkles. They taste great, too! Perfect size of the sprinkles but ordered the box that was too large. The box did arrive on time and easy to track with the order. This is the best sprinkles to make all your baked goods look like they were made by a professional artisan baker. These are great sprinkles. The colors are so much better than what is available in the stores. These look like ones you'd find in an ice cream shop and you get a great deal buying in bulk. I love these, the light smell of cocoa and the quantity for the price is amazing. So many ways to use these in my bakery! We get these for the smaller store we have, or when we are in a pinch. The taste of these sprinkles is by far the best- They are not too sweet, and have a great chocolate taste. Would recommend! I love these Chocolate sprinkles. They are classic on ice cream, but I use them to top my protein shakes. add a little chocolate touch on top. The price is great! Great for a wide variety of desserts and love the chocolate flavor to add and extra boost to whatever you happen to put it on. Large amount of sprinkles. We got theses to decorate cupcakes with and they will last a while. They actually taste like chocolate too so that's a plus. Regal chocolate sprinkles have a little crunch and really taste great. And of course, they are available at a great price from the Webstaurant Store! When i received this the bags were slashed thoroughly so a lot of them were spilling out of the box. I would recommend changing the packaging bags to prevent spills. The sprinkles were great. The chocolate sprinkles are perfect for less festive occasions. They taste good and always look good on my pretzels! I wish they came in 10 lb. size. These chocolate sprinklers were a lighter brown then I expected, however were delicious and shiny! All sprinkles were a god size, not too tiny and not too long and skinny. Just right! The price for the sprinkle toppings are a very good deal from here, my customers love the assorted variety of toppings we offer due to them being affordable. These chocolate sprinkles make almost anything even better. They are not only very tasty but visually pleasing as well. You can't have too many of these. This is a great price for 5 pounds of Chocolate sprinkles. They can be used for baking, decorating or even as a topping for ice cream. So many uses. Great topping for our ice creams, milkshakes and frozen yogurt. Greats a beautiful and attractive look for our desserts. The packaging is good but the bag can probably be sealed instead of the tie wrap. These chocolate sprinkles were a popular item for my sundae bar offerings. Everyone enjoyed the classic chocolate flavor and they looked great atop the whip cream. These Sprinkles are a great way to make your Ice Cream cups or cones more appealing and profitable. We charge 25 cents to add sprinkles. Incredible value for chocolate sprinkles! Arrived packaged well and received in perfect condition too. will no longer look for sprinkles elsewhere....please add more colors to your inventory as well as Nonpareils and sanding sugars. We used this for a fundraiser. Great taste. Only issue was the plastic bag inside the box had a slot in it and caused some to leak out of the bag into the box. Really nice product. No breakage during shipping. I will definitely order these again. They were perfect for the sundae bar we had at Vacation Bible School. No complaints here. Its unbelievable that we are able to purchase 5lb. of these sprinkles through WS to last a long time, when the area stores charge upwards of insane just for 10-12 ounces of sprinkles. This is a marvelous deal and has really helped us out in saving costs. The chocolate sprinkles through Regal are a good product, has worked for us; why change? Great, great, great value! Unbeatable price. Will be purchasing more for the holidays in various colors. I wish it came in some sort of clear container rather than a bag in a box, it would make storage so much easier. Other than that, get these! These chocolate sprinkles are very chocolaty. My clients love them over their frozen yogurt. They are a rich dark, shiny brown. They are a delicious treat! These are very tasty sprinkles, and are a great price for the amount of sprinkles. I have purchased many chocolate sprinkles, but never had people make comments about their taste...my customers have been very pleased with these. 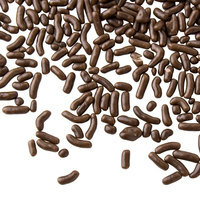 We are thrilled with the price and quality of these chocolate sprinkles! SIGNIFICANT savings over our local distributor! Plus getting them in a 25lb box means we don't have to order as frequently! Best price I've seen on chocolate sprinkles. Ice creams and baked goods are easily turned into something fun. They came in a bag in a box, my bag broke but the box hold them in. I just moved them into my storage container. Happy with my purchase. Delicious, chocolate-y, and decorative. We love rolling the chocolate cupcakes we serve on our mobile cupcake truck in these sprinkles for texture and protection on the road. These are just the sprinkles that I have been searching for! My common complaint from all of my customers was that the sprinkles were hard and crunchy. I tried several other brands before finding these chocolate sprinkles, which are perfect. They are NOT hard but soft and creamy. They taste like cake icing. I have received so many positive comments on these sprinkles. Who does not love chocolate sprinkles and putting them on ice cream is an extra treat. The kids that comes to our shop loves topping their ice cream with these sprinkles! 5 pounds of sprinkles? My children go nuts when these come in. They're great for me to use when baking and buying them in bulk means the kiddos can decorate their own donuts with them and I don't have to feel bad about them using SO many! Chocolate jimmies! YUMMY YUMMY YUMMY. My kids love these, whenever we have a sundae we use this as a garnish. Great on small desserts too! we love regal foods sprinkles! we are using them because they are not only inexpensive, they also taste good and very fast delivery! excellent product! What a great price for a TON of sprinkles (jimmies here in South Jersey). They are perfect for decorating cakes, cookies, and of course ice cream. Worth buying for home use since they are very expensive in the grocery store. Can't beat the price. Sprinkles had gotten messed up in shipping and they replaced them very quickly. No problem. Super fast shipping both on original order, and replacement. These sprinkles are perfect for our Death by Chocolate cake. They help us add another layer of chocolaty goodness and decorate the cake as well. Best deal on the web for these chocolate sprinkles. They work perfectly on our donuts. I don't think they have any chocolate taste, but the presentation works well. A must have for an ice cream parlor. Rainbow and chocolate sprinkles are the number one toppings in our parlor. We also use them on our sugar cookies. Buying in bulk is the only way to go with an item like this that is so popular. LOVE these sprinkles. I always make 7 layer italian cookies which require A LOT of chocolate sprinkles...this does the job well. Love the freshness and quality. By far the cheapest sprinkles you can find anywhere and great quality as well. Perfect for self-serve frozen yogurt and ice cream shops to make money on! Yum Yum, i sell oodles amount of these, sprinkles or Jimmies and some people call them. They stay fresh and tasty for quite a while. Tasty chocolate sprinkles are a favorite of most adults. You get a lot of them for a great price. They stay fresh for a long time. Great chocolate flavored sprinkles. Are wonderful for using as the center of Royal icing sunflowers. They also add a nice touch as a topping to chocolate truffles. These sprinkles are awesome! The box came with the sprinkles in a big bag, but we poured them into a container to serve for ease. Chocolate sprinkles are probably one of the most popular options you can have. These have a great sugary flavor and are perfect for topping all baked goodies. Chocolate sprinkles are always a demanding product. It's actually one of the first product to run out when serving them in ice cream shops or events. I love these chocolate sprinkles. They add a nice pop of color and texture when put on lighter colored frosting or fondant and they add a nice texture to any brown colored frosting. I use these sprinkles for my mocha cupcakes. They have a great flavor and really do taste like chocolate! They also add a great crunchy flavor to cupcakes and ice cream.